Switzerland is a notoriously expensive country to visit. Whether you're a student, backpacker, or budget traveler, hostels can offer a fun and affordable alternative to traditional hotels. 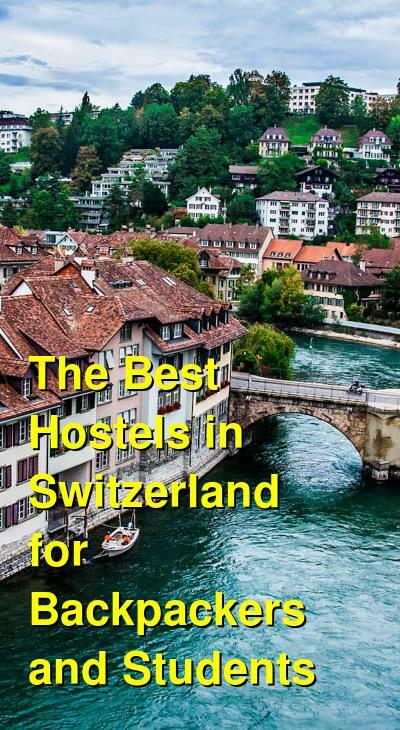 Some cities in Switzerland have more hostels to choose from than others. The price and quality can also vary, but in general, hostels are a great option if you're trying to save money. How much do hostels in Switzerland cost? A quiet and affordable hostel in Interlaken, Switzerland. If you're looking for a quiet and comfortable hostel in Interlaken, then Backpackers Villa Sonnenhof Hostel is a good option. It's a popular and affordable place to stay that has a friendly staff and a variety of amenities for guests. The staff can recommend all kinds of activities in the area. Whether you're looking for adrenaline filled outdoor sports or just a place to take a stroll, the hostel staff can make a recommendation. The hostel also includes an all-you-can-eat breakfast, security lockers, and free entry to public swimming pools, mini golf, and more. There's a shared kitchen available for guests who want to prepare their own meals and there's a nice outdoor space if you want to hang out with other guests. The rooms are simple but clean. They range in size and style and options include six or sixteen bed dorms, as well as a variety of private rooms. Located in Interlaken, this is one of the most popular party hostels in Switzerland. Switzerland isn't exactly known for its party scene, but if you're looking for a party hostel, then Balmers Hostel is probably one of the most well know. It's located in Interlaken, and every night they host activities including dance parties and drinking games. During the day you can take advantage of the beautiful scenery and outdoor activities that Interlaken offers. The hostel has a wide variety of rooms to choose from. There are single, twin, double, and three bed private rooms as well as four to ten bed dorms (with everything in between). A good hostel for backpackers and students in Zurich, Switzerland. 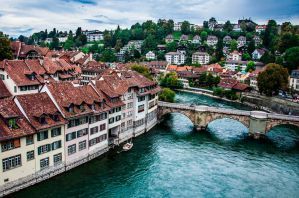 Zurich, like elsewhere in Switzerland, is an expensive city to visit. There are relatively few hostels to choose from in the city, so if you're looking for the highest quality, then a hotel may be your best option. If you want affordability and are ok with basic accommodation, then look for a hostel. Oldtown Hostel Otter is a good option in Zurich for backpackers and students who want to save some money. The hostel is in a good location just a few minutes from the lake. It is near the city's old town and has both dorms and private rooms available. There's a cafe and bar on the ground floor where you can hang out with other guests or locals. There's also a small kitchen area that guests can use with a microwave, refrigerator, and oven. There are 45 beds in total that are split between double and twin private rooms as well as four and six bed dorms. An affordable hostel for students and backpackers in Geneva. If you're traveling on a budget and want to stay somewhere affordable, then City Hostel Geneva is a basic but decent option. It's location is convenient and it's less than a ten minute walk from the main station. The rooms are small and basic, but there are both private rooms and dorms to choose from. The dorms sleep only three or four people so they have a more private atmosphere than many hostels. There are also single and twin private rooms available. There are a variety of amenities available to guests including shared kitchen facilities, travel information, and several different discounts for activities around town. If you're traveling on a budget and don't want to pay for a hotel, then City Hostel Geneva is a decent option. A quiet, safe, and comfortable hostel in Lucerne, Switzerland. Backpackers Lucerne is a popular place to stay in Lucerne for backpackers and budget travelers. The rooms are comfortable and clean and the price is reasonable. The hostel offers all of the standard amenities for guests including a shared kitchen, internet access, travel information, and a laundry service. There are about thirty rooms in total - nine with four beds, nineteen with two beds, and two three bed rooms. This hostel appeals to a variety of different travel types. Whether you're a solo traveler, or visiting with a group of friends, this is an affordable and convenient place to stay. A popular hostel for backpackers and budget travellers in Bern, Switzerland. The biggest selling point for this hostel is its central location. It's in a historic building in the UNESCO world heritage area and it's conveniently close to restaurants, bars, and museums. It should be noted that the hostel is located on top of a bar, and it can stay quite loud until late in the night, particularly on weekends. The hostel is an affordable option with friendly staff. It's clean and comfortable and makes a good base for exploring the area. There are a variety of dorm options available that sleep between two and six people. If you want a bit more privacy, there are single and double private rooms. If you want to meet other guests, there's a large common room where you can hang out. There's also a shared kitchen available, laundry facilities, and internet access. If you're looking for affordability in a prime location, then Bern Backpackers is a good option. A good hostel for students, backpackers, and groups of travellers in Basel, Switzerland. If you're looking for an affordable youth hostel in Basel, then this is a good option. It has 234 beds in total that are spread between dorms and private rooms. There are doubles and four bed family rooms as well as four and six bed dorms. The hostel has a variety of amenities available for guests. There's a breakfast buffet that's served every morning and included in the price of the room. There are also delicious lunch and dinner options which guests can pay for. If you're traveling as part of a group, your group can also request special catering. If you're looking for a comfortable and pleasant place to stay that won't be too expensive, then Youthhostel Basel is a good option. A quiet and affordable hostel in Lausanne, Switzerland. Lausanne Youth Hostel is a clean and quiet place to stay that has a welcoming atmosphere. It's located a bit out of the way, but it is relatively affordable. The hostel is a good option for both solo travelers as well as those traveling in groups. There is also parking available outside of the hostel for those who arrive with their own vehicle. The hostel has 320 beds in total. There are a wide variety of rooms to choose from including singles, doubles, and dorms that sleep up to four people. If you're looking for basic but comfortable, then Lausanne Youth Hostel is a good choice. A good hostel for school groups and budget travellers in Zermatt, Switzerland. Zermatt Youth Hostel is another option in the area that appeals to a variety of different travelers. Like many hostels in Switzerland, it can feel a bit overrun with school groups, but the quality is decent and the price is reasonable for the area. The hostel has a relaxed atmosphere and there are a variety of amenities available to guests including a breakfast that is served every morning. Do take note that there are no kitchen facilities available, so food costs can become quite high. The hostel is located between the town center and the Klein Matterhorn Railway station, which is about a fifteen minute walk away. There are 174 rooms in total that are spread between private rooms and dorms. There are private rooms that sleep anywhere from two to six people. There are also four, six, and eight bed dorms available. A peaceful and quiet hostel for hikers and backpackers in Grindelwald, in the Jungfrau Region of Switzerland. Downtown Lodge is located in the middle of Grindelwald, in the Jungfrau Region in Switzerland. It is surrounded by natural beauty, and it makes a great base for exploring the area. The hostel actually has five lodges and a total of 300 beds, so there are plenty of options for travelers. Whether you're traveling alone or as part of the group, you're sure to enjoy your stay here. The hostel staff is friendly and helpful and can offer all kinds of suggestions for hiking and outdoor activities in the area. There are also discounts available for different activities so be sure and ask the staff for any coupons they may have on hand.